Figure 1. 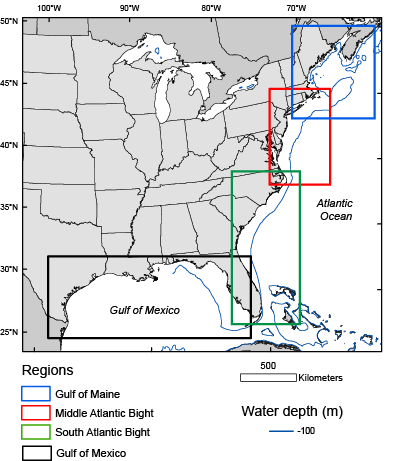 Map showing the Gulf of Maine, Middle Atlantic Bight, South Atlantic Bight, and Gulf of Mexico regions for which bottom stress and sediment mobility have been estimated. The U.S. Geological Survey Sea Floor Stress and Sediment Mobility Database contains estimates of wave-current bottom stress and sediment mobility for the U.S. Atlantic and Gulf Coast continental shelf regions (fig. 1). This USGS database provides information to address issues in coastal and offshore areas where the degree and/or frequency of sediment mobility are important, such as characterization of sea floor ecosystems and evaluation of areas prior to development. The estimates contained in the database are designed to spatially and seasonally resolve the general characteristics of wave-current bottom shear stress over the US continental shelf, and to estimate sea floor mobility by comparing the modeled stress to critical shear stress thresholds for initiation of sediment movement at sites where grain size data are available. All stress values are given in Pascals (Pa). The methodology for creating the estimates of bottom stress and sediment mobility contained in this data base may be found in Dalyander and others (2012). The database is organized by region (fig. 1). Select the region of interest from the navigation panel to download files showing previews of results, metadata, and sea floor stress and mobility statistics in Arc polygon and point shapefile format. Statistics will be added to this website as they are completed (see Database Update History). Dalyander, P. Soupy, Butman, Bradford, Sherwood, C.R., and Signell, R. P., 2012, U.S. Geological Survey Sea Floor Stress and Sediment Mobility Database: U.S. Geological Survey data release, http://woodshole.er.usgs.gov/project-pages/mobility.